At the end of the 2016 FIA World Endurance Championship season Mark Webber will quit his professional racing career to become Porsche special representative. The six-hour race in Bahrain on November 19 will be the last time the reigning World Champion from Australia will compete as a works driver. Afterwards new tasks await the nine times Formula One Grands Prix winner: 40-year old Mark Webber will represent Porsche at global events and as a consultant will contribute by lending his experience to the motorsport programmes of the sports car manufacturer from Stuttgart. This includes talent research as well as driver training for up and coming professionals and the huge number of worldwide Porsche amateur racers. Alongside rally legend Walter Röhrl (69) Webber is now the make’s second representative. Both are distinguished by a successful racing career as well as by a huge affinity to Porsche. "Mark Webber stands for everything what Porsche implies: sportsmanship, power of endurance, straightforwardness and focused work for success. He is full of beans and always a thoughtful listener. I want to thank Mark for his great performance in the World Endurance Championship and am pleased he will remain tightly connected to Porsche in the future", says Oliver Blume, Chairman of the Executive Board of Dr. Ing h.c. F. Porsche AG. Fritz Enzinger, Vice President LMP1, is sorry to see the driver retire from the cockpit. "Already in the important period of building up the programme, Mark has strengthened us with all his experience and he seamlessly integrated himself into the team. Behind the wheel he is a fair fighter, never shy of even the toughest wheel-to-wheel battle. At the same time, he thinks strategically and is team orientated. This mixture makes him invaluable as an endurance racer. Winning the 2015 drivers’ world championship together with Timo Bernhard and Brendon Hartley almost seemed to be a logical consequence. Also thanks to his performance, we hope to win the world championship titles for manufacturers and drivers again in 2016." Currently the Porsche Team ranks first in both classifications. In the manufacturers’ world championship Porsche leads with 238 points ahead of Audi (185) and Toyota (137). Romain Dumas/Neel Jani/Marc Lieb have a 37.5 lead ahead of the best placed Audi trio. There are still three races remaining. "I have arrived where I belong", says Mark Webber. "Porsche is the brand I always loved most and the one that suits me the best. The 911 is iconic - it has got elegance, performance and understatement, and is never intrusive. It is just the right car for every scenario." He continues: "I will miss the sheer speed, downforce and competition, but I want to leave on a high and I’m very much looking forward to my new tasks." Mark Webber has no need to quit his professional racing career. His lap times still top the time-sheets, he remains fit, his experience is priceless and his relationship with his teammates has bonded into lasting friendships. Webber always knew what he wanted after his successful Formula One career. "It was a big change from Formula One to LMP1 and an entirely new experience. But it came at the right time for me. I found I liked sharing a car and the chemistry between Timo, Brendon and me is special and something I’ll always remember. It will be strange getting into the race car for the very last time in Bahrain but for now I will thoroughly enjoy every moment of the remaining races." 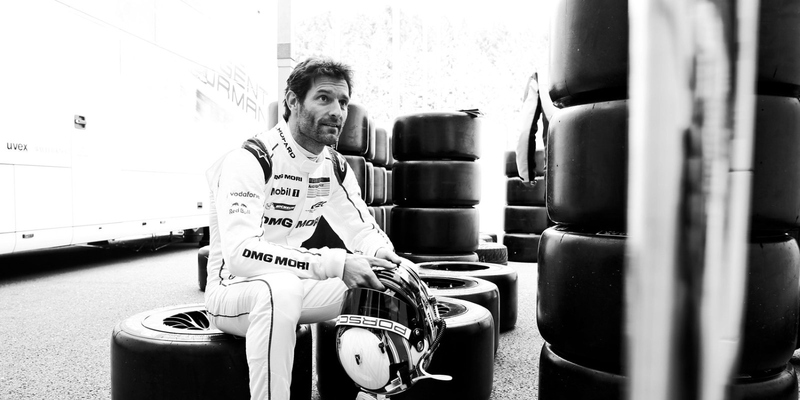 Since 1991 everything in Mark Webber’s life has been dedicated to racing. Karting, Formula Ford, Formula 3, Formula 3000, 215 Formula One Grands Prix including nine victories and 42 podiums in what is the pinnacle of motor racing. In 2013 he found his home at Porsche. As early as in 2015 he became FIA World Endurance Champion, a title he was fighting hard for, together with Timo Bernhard and Brendon Hartley in their 919 Hybrid Le Mans Prototype. 2016 though marks a year of changes in the life of the popular Australian. Early this summer he married his long-time partner Ann, on August 27 he turned 40 and at the end of the 2016 season he will give up with professional racing to take on his new role as Porsche’s special representative and consultant. Webber is a straightforward man and he’s honest with himself. In his book Aussie Grit: My Formula One Journey, published in 2015, he gives a deeper insight into his career. He left his home in Queanbeyan in New South Wales, Australia, at the age of 19 with a clear goal – to further his career as a racing driver in England. He was one of many, and one of those without a sponsor, but he had natural talent. He won the prestigious Formula Ford Festival at Brands Hatch, contested Formula 3 and Formula 3000. He was invited to join the sports car programme at Mercedes. The 24-hour Le Mans race was set to be the highlight of the 1999 season. The car and the team were considered favourites. But the car’s aerodynamics were on a knife-edge. Webber’s car launched into a backflip in the qualifying session and again in the warm-up. He survived two dramatic crashes unharmed, but his career seemed to have run out of steam. The page turned, however, with a successful Formula One test drive for the Benetton team, which secured him a test and reserve driver position in 2001. Webber's Formula One debut was memorable: he finished fifth in 2002 at his home Grand Prix in Melbourne - with an inferior Minardi. In 2005 he scored his first podium with the former BMW WilliamsF1 team. He celebrated his first F1 win at the 2009 German Grand Prix with Red Bull Racing in his 131st Grand Prix. In 2010 and 2012 he won the Monaco Grand Prix. After 15 years, it was an older and more mature Webber who returned to La Sarthe in 2014. His incident-packed experience from 1999 seemed far away, but the much wanted victory has continued to evade him: In 2014, as he was driving in second place with only two hours to go when a bang from the powertrain shattered the dream. In 2015, the 919 that he again shared with Timo Bernhard and Brendon Hartley was running in the lead during the first third of the race, only to have a time penalty to relegate them down the field. The trio launched a charge through the field to claim second place. In 2016 it was a damaged water pump that prevented him and his teammates from winning Le Mans. The biggest triumph was achieved at a nerve-wracking finale in November 2015 in Bahrain: both throttle barrel levers were broken and had to be locked at full throttle. The 919 was only able to finish the race thanks to outstanding engineering performance in the background and a driver sensitivity that looked superhuman. The title was at stake. "To have scored my first World Championship title with Timo and Brendon with Porsche means a great deal to me," says Webber who never talks about this feat without mentioning his teammates. His affinity to Porsche, however, is nothing new. As a teenager he drove a 911, borrowed from a friend, and when he bought his own first Porsche he went straight for a Turbo model. Today the collection includes a 918 Spyder, a 911 R, a GT3 RS (991), a 911 GT2 RS (997), a 911 GT3 RS 4.0, a 1954 356 Cabriolet and a 1974 2.7 Carrera.